Why does YouTube fullscreen not work? A friend of mine is a total YouTube addict for his channel. He complained to me that he got in trouble with YouTube fullscreen problems a few days ago. The fullscreen button appears in the lower right corner, but isn't responsive. “Why is my YouTube video not full screen?” You probably have the same question as my friend. Actually, YouTube fullscreen not working issue is a frustrating common error reported by numerous YouTube users while watching preferred videos. 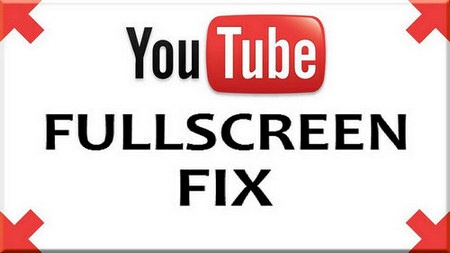 Don't worry, here you can find some solutions to fix YouTube in fullscreen problem. YouTube fullscreen problem typically occur when playing videos online. 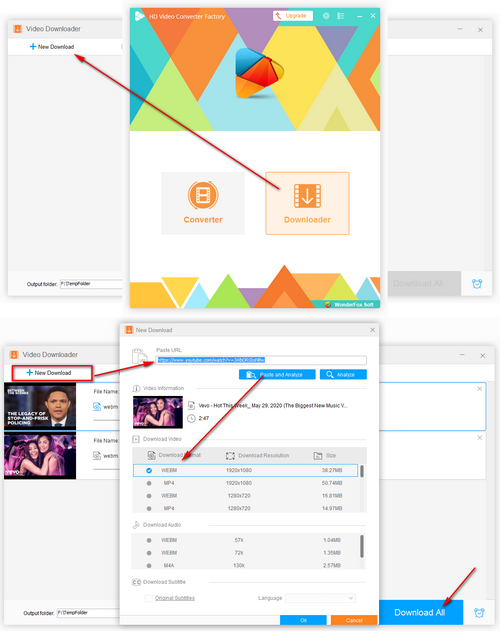 If you need a quick solution to play a YouTube video and in fullscreen mode, you can download the YouTube video and even playlist with Free HD Video Converter Factory. The program is 100% free, safe and fast. Why is YouTube fullscreen not working? Actually, there are many cases leading to YouTube fullscreen glitch issue. Let check the related solutions to fix full screen on YouTube not working problem now. Sometimes, YouTube videos full screen problems are probably caused by outdated video card driver. Set Windows system as an example. 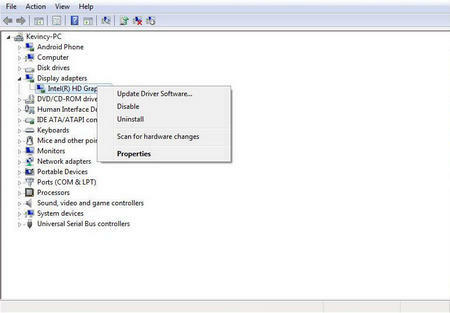 You can follow the steps below to update your PC graphics card driver for fixing YouTube screen problem. Step1: Open “Control Panel” and click “Hardware and Sound”, then go Device Manager. Step3: It will go to corresponding manufacturer's official website, you are supposed to download and install the latest driver to possibly fix YouTube fullscreen bug. If you’re using Google Chrome, you may experience YouTube fullscreen not working chrome which is mainly caused by the out-of-date version of browser and Flash Player. Besides updating your browser to the latest version, you can also follow the method to check whether or not the browser supports HTML 5 player and make it available. Step1: Visit https://www.youtube.com/html5 to check whether the browser supports html5 player. 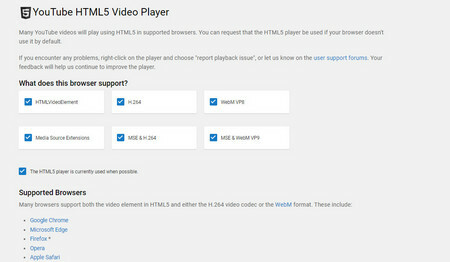 Step2: Make sure "HTMLVideoElement" and "The HML5 player is currently used when possible" are checked. Similarly, while most YouTube videos use html5 player now, a few videos still supports Flash player so go to http://www.adobe.com/software/flash/about/ to check if your Flash plugin is up-to-date. If not, update Flash there to fix YouTube screen size problem. You may be encountered with the problem after you have checked and updated your browser and players, fullscreen not available YouTube issue still exists. Here I show you a more detailed procedure to fix YouTube fullscreen not full screen on Google Chrome. It also applies to Safari YouTube full screen and Firefox full screen YouTube issues. Step1: Just go to your Chrome address bar, type " chrome://settings/ " and hit "Enter"
Step2: Then, click on the "Advanced" button. 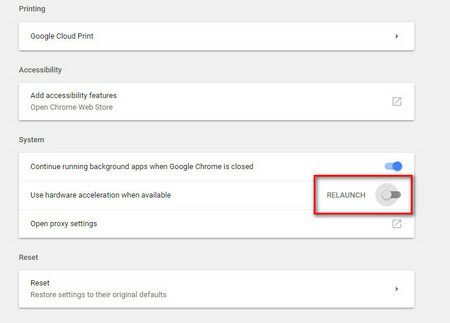 Step3: Scroll down and find “Use hardware acceleration when available”. Step4: Disable the hardware acceleration. 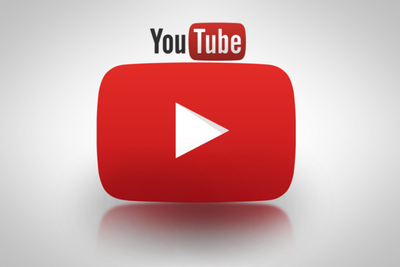 Now you can open YouTube to check whether YouTube full screen problems go. Certain browser add-ons/extensions/applications may make YouTube videos not full screen, e.g. AdBlock. Try to disable your plugins one by one until you determine which is causing YouTube not showing full screen mode. Step1: Open Chrome and go to chrome://extensions. Step2: Disable single extension and open YouTube fullscreen mode. Step3: If the fullscreen mode works, you don’t need to disable other extensions anymore. If it doesn’t, disable extension one by one to find the exact one. Another kind of YouTube not fullscreening properly problem is special. If you cannot watch embedded videos in YouTube full screen size on other sites out of YouTube, the most likely reason is the website owner has disabled fullscreen function. You should click "YouTube" icon in the lower right corner to watch the original videos on YouTube.com. Free HD Video Converter Factory offers the quick and easy way to download YouTube videos & playlist and fix the issue that YouTube doesn't go full screen. For you who have tried all the methods above but still don’t have clues, this option is worth a try. 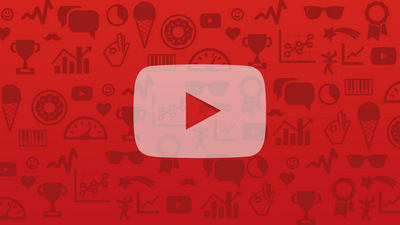 Most YouTube users have also encountered with many other common YouTube errors when watching videos online. Considering reasons causing those problems are various and you can’t find the suitable solution all the time, the alternative method for you to watch YouTube videos smoothly is to download them for offline playback without any playback problem. 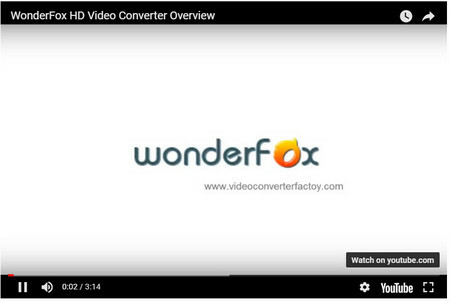 HD Video Converter Factory is such a free and powerful YouTube downloader to download YouTube videos at sharp speed. It even allows you to download 1080P videos, 4K/8K videos, 360-degree videos, download VR videos and YouTube music with fast speed in batches. With this freeware, you can fix YouTube fullscreen issues by offline playback in full screen mode at one go. Before start, please free downloadfree download and install the freeware. Then follow the tutorial to free save any YouTube video. Click "Download Video" on the menu bar. Copy and paste your desired YouTube URL, then press "Analyze" button. After analyzing URL, choose your expected quality displayed in different resolutions and video sizes. Finally, click Download to complete this job! Now you can watch the videos offline and get rid of any YouTube fullscreen problem. Tips: Try to re-analyze the URL if you don't see the due resolution owned by original video in the list; You can also copy & paste YouTube playlist URL to download the entire YouTube playlist. After done, you are allowed to convert downloaded video to a wide range of preset optimized formats and devices by clicking “Output Formats” on the right side. Tips: It allows you to convert YouTube videos to MP4, AVI, MKV, WMV, MPG, MOV, H264, H265 and many other formats and encoders. Then, choose the profile you need and hit Run button to convert video. How to fix YouTube fullscreen glitch? As you can see, downloading YouTube videos is also a good method to full screen YouTube not working issues. You must get all the common solutions on YouTube not going fullscreen now. However, you can find that this problem relates to many aspects, so you need time to eliminate the irrelevant factors and find the crux. Meanwhile, due to the differences of browsers, Operating Systems, development of the internet and other unknown reasons, the solutions above may not be appropriate for all of you. In this case, you are highly recommended to download YouTube video which applies to all situations without any trouble. Also, you are welcomed to share your experience below if you've solved YouTube full screen problem. 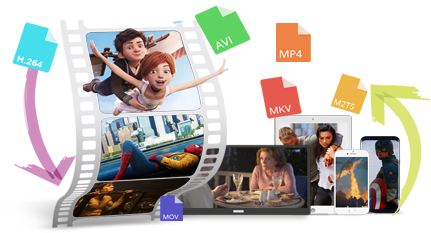 Moreover, HD Video Converter Factory supports 300+ formats conversion, helps you to compress video with best quality but smallest size, extract soundtracks from film/video, etc. 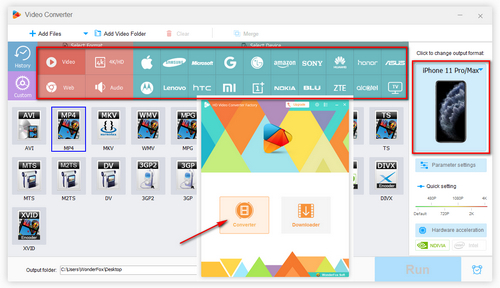 You can also try the advanced HD Video Converter Factory Pro to download videos and convert them to 300+ formats in batches. It supports enhancing video quality to HD and 4k, compress video size with high quality preserved, etc. More other useful functions are waiting for you to explore.